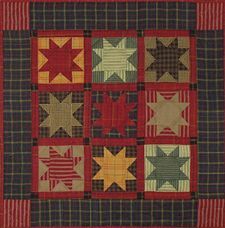 Order a made up sample model hereRustic homespun fabrics in plaids checks and stripes come together to create a quilt bringing comfort and warmth to wall or tabletop. Finished size is 22" x 22". Kit includes all 100% cotton fabrics needed to complete the quilt (including quilt top backing and binding) plus batting precise patterns and complete instructions. Colors are blues beige green red and gold.